Established in 1948, the Maryland Academy of Family Physicians (MDAFP) is the state chapter of the 131,000-member American Academy of Family Physicians (AAFP). The MDAFP represents over 1,300 members and is governed by a 21-member board of directors. AAFP/MDAFP work to improve the health of patients, families and, communities by supporting and promoting its members. We act as your voice and your resource on a national, state, and local level, providing important resources, specialty information, and career and practice guidance. 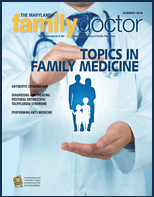 Members of the Maryland Academy of Family Physicians have privileged access to all kinds of resources including reliable newsletters, philanthropic opportunities, Continuing Medical Education (CME) and more. We want to help the residents and students that are excited about Family Medicine and that will shape the field in the future. View the available awards and reflect on the achievements of members that warranted special recognition and celebration from MDAFP and AAFP. Each month, the President of MDAFP addresses the organization’s members with a written message addressing topics relevant to Family Medicine, Maryland and the American Academy of Family Physicians as a whole.